For decades, the Argentine human rights group, Madres de Plaza de Mayo (Mothers of the Plaza de Mayo), has been respected for its work bearing witness to the thousands of disappearances during the Dirty War (1976-1983). 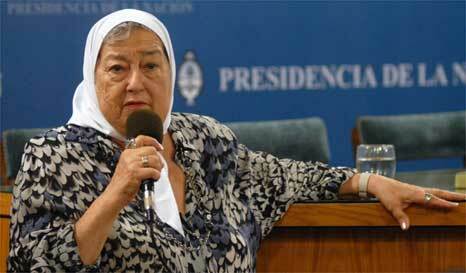 In recent years the Asociación Madres de Plaza de Mayo, a faction of the original group led by Hebe de Bonafini, has sparked significant controversy because of her divisive comments on topics ranging from September 11 to anti-Semitism. 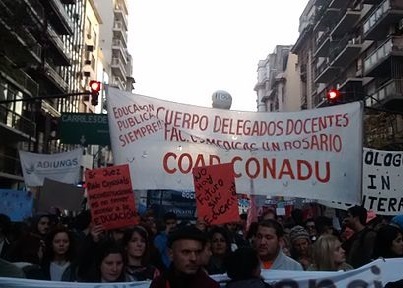 Most significantly, the recent embezzlement scandal involving the organization’s housing program as well as Bonafini’s possible involvement in illegal activities threatens to destroy the reputation of the group and harm its political allies. The Madres de Plaza de Mayo’s crusade for human rights began in April 1977 during Argentina’s Dirty War when 14 mothers of disappeared individuals began regular protests in the Plaza de Mayo in front of the presidential palace. Their courage in the face of the brutal military junta inspired other women with disappeared children to join the demonstrations. As their numbers steadily grew, the Madres gained worldwide renown for their distinctive white kerchiefs embroidered with the names of their children–a symbolic invocation of their disappeared offspring– and their daring to stand up to the ruling junta. The Madres claim that approximately 30,000 people kidnapped by the government remain unaccounted for, including 500 babies. The protests have continued on a weekly basis even though the junta fell in 1983. In 1986, the Madres split into two distinct factions: the Madres de Plaza de Mayo-Linea Fundadora (Founding Line) and the Asociación Madres de Plaza de Mayo. The Linea Fundadora has focused on bringing the Dirty War perpetrators to justice as well as discovering remains and identifying those children who were adopted by officials and junta allies. The Asociación faction, led by Hebe de Bonafini, has become much more political, working to uphold what they consider to be the agenda of the disappeared. To further this goal, they have established a newspaper, radio station and a university. In recent years, they have taken their children’s socialist dreams to the next level by managing a government-funded housing program named Sueños Compartidos (Shared Dreams). In recent years, Bonafini has made many controversial statements that contradict the Madres’ stated mission to protect human rights. Though Bonafini’s anti-American sentiments resulting from the U.S. support of the military junta are widely known, her statements regarding the September 11 attacks shocked many. After the attacks she asserted, “When the attack happened I was in Cuba visiting my daughter, and I felt happiness. It didn’t hurt me at all, because, as I always say in my speeches, our dead children will be avenged the day when people, any people, are happy.”  Additionally, she has displayed her anti-Semitism, attacking respected Argentine journalist Horacio Verbitsky for criticizing the Asociación, saying he “is a servant of the United States. He receives a salary from the Ford Foundation, and in addition to being a Jew, is totally pro-North American.”  Under her leadership, the Asociación has also admiringly published a collection of writings by Saddam Hussein that ignored his major human rights atrocities simply because of his disdain for the U.S. With Bonafini’s problematic principles guiding the organization, the Asociación has practiced selective indignation regarding human rights violations and compromised the Madres’ moral authority as voice for human rights. On May 8, 2011, Schoklender left the Asociación, claiming that the project was no longer compatible with his personal interests. Others claim, however, that Bonafini forced him out due to his financial mismanagement and questionable business practices. Because of his alleged embezzlement, racketeering, and money laundering, Schoklender now faces charges of illicit enrichment and misappropriation of public funds. 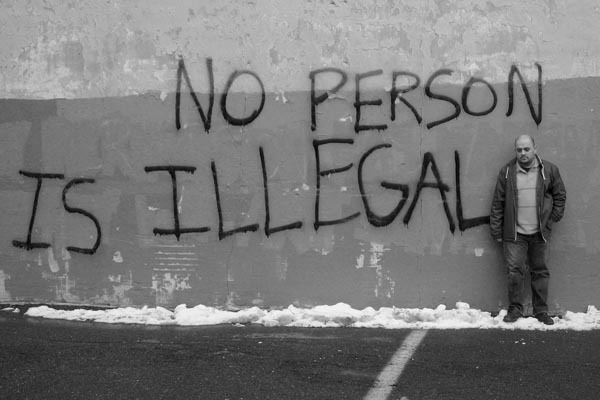 The Asociación has long been viewed as a prestigious human rights group fighting for the justice for the disappeared children. However, Hebe de Bonafini’s controversial comments and the recent massive construction scandal threaten the reputation and once noble legacy of this organization. Their reputation could potentially be salvaged if Bonafini was willing to retire from the organization, although this is unlikely due to her firmly held prejudices and her stranglehold on the organization. 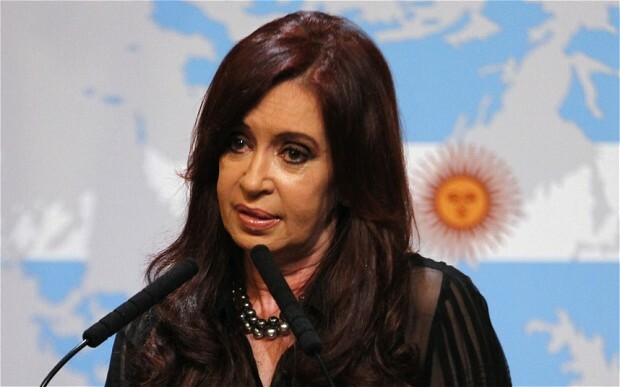 If Bonafini does not remove herself from the Asociación, Cristina Fernández will be forced to distance herself further from this formerly revered organization in order to protect her own reputation and popularity. Bennett, Carlos. 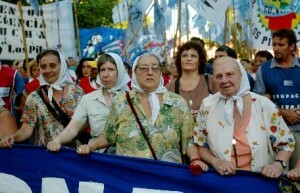 University of Texas, “Madres de Plaza de Mayo.” Accessed July 26, 2012. Marchesi, Aldo. Social Science Research Council, “”The War Against Terrorism” and Collective Memory in Uruguay and Argentina.” Accessed July 26, 2012. Clarírn, “Las Madres de Plaza de Mayo realizaron la última Marcha de la Resistencia.” Last modified January 26, 2006. Accessed July 26, 2012. http://edant.clarin.com/diario/2006/01/26/um/m-01130827.htm. La Nacion, “Claves para entender el caso.” Accessed July 26, 2012. http://www.lanacion.com.ar/1379872-claves-para-entender-el-caso. Moffett, Matt. The Wall Street Journal, “http://online.wsj.com/article/SB10001424052702303848104576386344164560756.html.” Last modified June 16, 2011. Accessed July 26, 2012. http://online.wsj.com/article/SB10001424052702303848104576386344164560756.html. de Carlos, Carmen. ABC Internacional, “La Estafa de las Madres de Mayo.” Last modified June 16, 2011. Accessed July 26, 2012. http://www.abc.es/20110616/internacional/abcp-estafa-madres-mayo-20110616.html. Buenos Aires Herald, “‘Bonafini is a liar and needs to clarify many things,’ Pablo Schoklender.” Last modified July 7, 2011. Accessed July 26, 2012. http://www.buenosairesherald.com/article/105544/bonafini-is-a-liar-and-needs-to-clarify-many-things-pablo-schoklender-. Buenos Aires Herald, “Schoklender insists Bonafini ‘managed’ organization’s funds.” Last modified June 25, 2012. Accessed July 26, 2012. http://www.buenosairesherald.com/article/104521/schoklender-insists-bonafini-managed-organizations-funds.